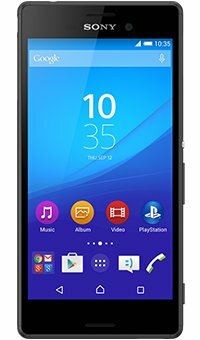 The waterproof and dust-tight Sony Xperia M4 Aqua has a 5-inch HD display, 2-day battery, 13 megapixel camera and a super wide-angle 5 megapixel front camera. 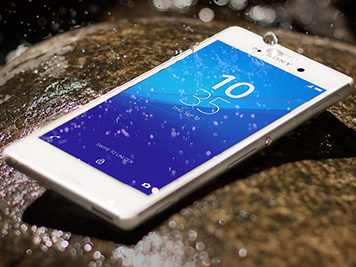 Waterproof and dust tight*, the Xperia M4 Aqua is perfect for the outdoors. 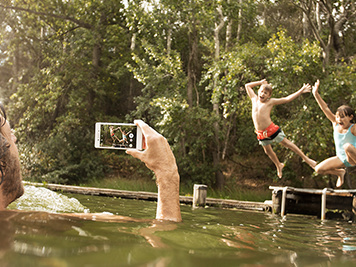 Featuring the same design as Sony's premium devices, it has the highest IP rating for a smartphone - IP65/68 - meaning you can take photos and videos 1.5 metres under fresh water for up to 30 minutes. The Xperia M4 Aqua's 13 megapixel camera features an advanced mobile image sensor and HDR for both photos and videos - giving you crystal-clear definition and luminosity, even in low light. And with the 5 megapixel, super wide-angle front camera you can fit even more into your selfies. For days that are jam-packed with work or play, the Xperia M4 Aqua keeps up thanks to a battery that lasts up to 2 days**, so you won't have to worry about staying out and about. And when you're seriously low on battery, Ultra Stamina Mode helps you get every bit of charge from your battery. *The Xperia M4 Aqua is waterproof and protected against dust as long as you follow a few simple instructions: all attached covers are firmly closed; you can't take the phone deeper than 1.5 m of water and for longer than 30 minutes; and the water should be fresh water. Casual use in chlorinated pools is permitted provided the phone is rinsed in fresh water afterwards. No seawater and no salt water pools. Abuse and improper use of device will invalidate warranty. The phone has an Ingress Protection rating of IP65 and IP68. To see what this means and for more information see www.sonymobile.com/durability. 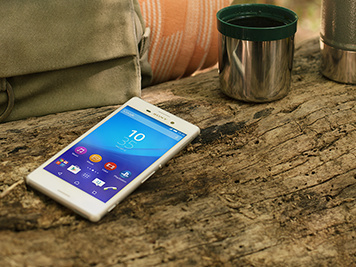 Do note that the Xperia M4 Aqua has a capless USB port to connect and charge your smartphone. The USB port needs to be fully dried up before charging if the phone has been exposed to water. **Battery life has been measured against Sony Mobile Communications AB's smartphone usage profile, defined in September 2014 to represent the typical smartphone user's active condition, including but not limited to a range of usage scenarios (calling, texting, web browsing, social networking, game playing, music listening, picture taking, picture browsing, online video watching, video recording and playback).